Happy Freebie Friday! Congratulations on making it through another week and as a reward we’re giving you a sneak peek at our newest game, Forgotten Trail. The high demand and interest for Forgotten Trail has been overwhelming, as people have been asking to play the game. Originally part of our Summer Games section, this mini-game serves as the perfect introduction to the world and characters of Forgotten Trail. 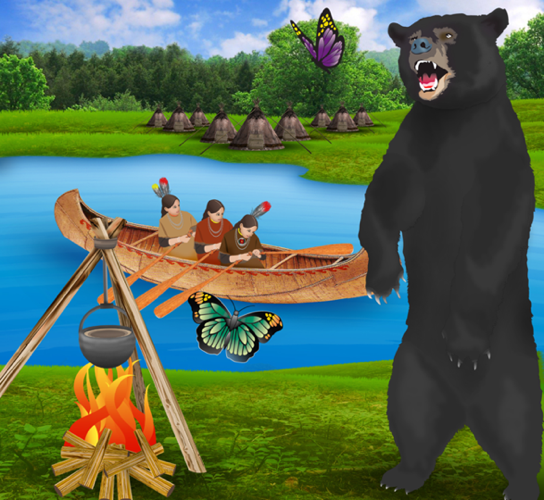 Our newest game focuses on fractions and teaches about Ojibwe culture and modern, real-world applications of math. Make your way across the country. Navigate through mazes. Avoid skunks. Catch chickens. Watch a graphic novel come to life. See why math matters. Grades 5 and up. Mac and PC. Don’t forget that you can receive a FREE beta version of Forgotten Trail with every purchase or donation through this holiday season. The beta release is of the first five levels of the game. We know that the stress of holiday shopping can give anyone a headache, so why put yourself through that. From the comfort of your house, you can buy our games without the hassle of battling for parking spots. Enjoy your weekend playing this mini-game! An educational way to tap the subconscious mind of an eager developing young learner. If this had been around when I was a child I would have enjoyed and remembered the lessons. The aha moment in learning and desire to proceed and continue forward is the vital key typical educators never cared or understood to explore. Much respect to all the dedicated individuals involved in bringing this to children today.